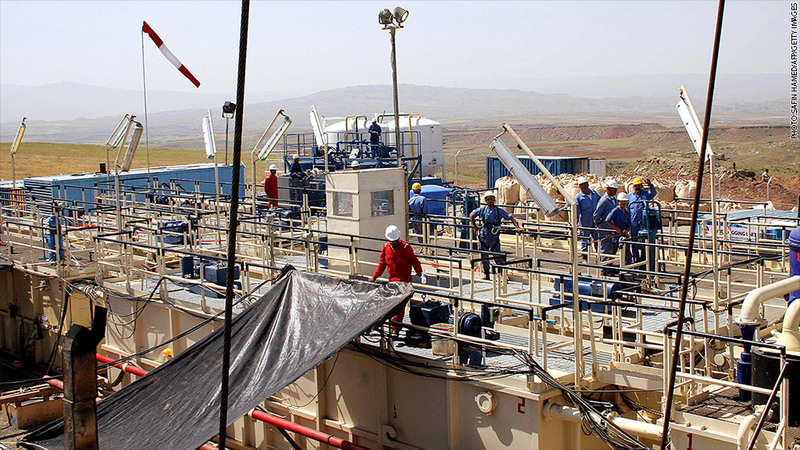 Genel Energy said its oil drilling facility in northern Iraq is secure, but still withdrew some employees from the area. Some major oil companies are evacuating staff from northern Iraq after President Obama authorized targeted airstrikes. U.S. jet fighters on Friday launched air strikes against Islamic extremists in the Kurdistan region of Iraq, prompting Genel Energy (GEGYF), the largest independent oil producer in the region, to withdraw non-essential personnel from the area. Other oil production companies, including Afren (AFRNF) and Oryx Petroleum, were also withdrawing employees as well as temporarily suspending drilling at some sites. While the escalated American military involvement may be heightening security concerns, the affected region contributes just about 15% of Iraq's oil production. Crude oil prices barely budged on the move -- rising 0.3% to $97.62 a barrel on Friday. That's because even if all production was suspended in the area, that amounts to a loss of only about 450,000 barrels a day, according to David McColl, an energy analyst at Morningstar. However, what worries traders long term is the threat that the violence could impact exports from the south -- the heart of the country's oil industry. "The big issue, and it always has been, is if ISIS continues its march toward Baghdad and further south towards the bigger oil fields," said McColl. Oil prices spiked in June on fears that Iraq exports could eventually be affected. However prices have since retreated, and are down 6% in the past month.